Sometimes Tech students have a little trouble loosening up and having a laugh. The members of Let’s Try This!, Tech’s resident improv troupe, don’t tend to have this problem; in fact, they’re so good at it that they competed on the national level. On Saturday, Feb. 25, LTT! traveled to Chicago to compete at the 10th Annual College lmprov Tournament along with fourteen of the best improv troupes in the country. LTT! competed at regional semifinals last semester. They placed second in a preliminary round, qualifying for the “wildcard round,” which pitted the second-place winners against each other. They came out on top, becoming one of three teams from the region to move to nationals. At both regional and national levels the teams had around 20 minutes to wow the judges in any way they could by getting huge laughs from the audience. Judges make their decision based on how well each group achieves the goal of the form of improv they choose to perform. LTT! 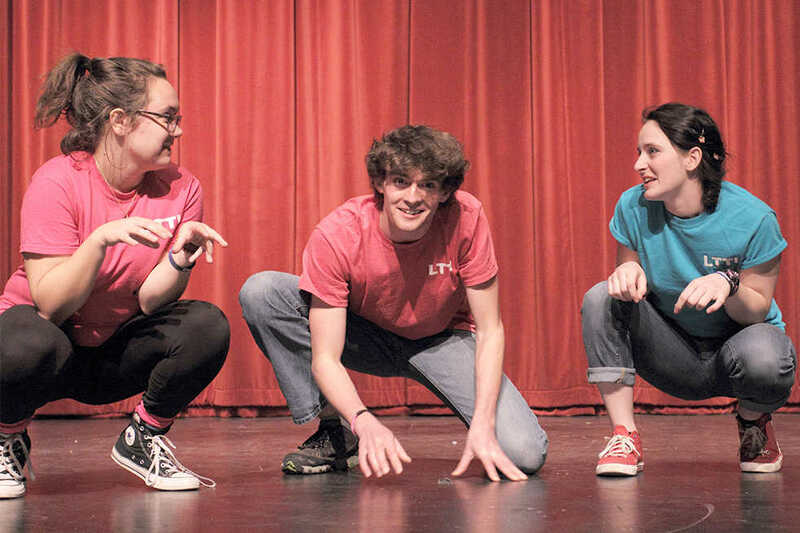 normally holds two relatively casual improv workshops a week for their members, but in preparation for Nationals they narrowed down their focus and got to work. One session was simply practicing a form of improv, but during the other they would all focus on a skill that a member deemed was lacking. Isbill, as well as Miranda Fyfe, James Nugent, Caleigh Derreberry and Thompson Bertron eventually made the trek to Chicago’s Vittum Theater, after over a month of practice. Teams would compete in a Super Regional, which pitted regional teams against each other for a spot at Finals later in the night. Saturday, the big day, came around. While they didn’t do as well as they had hoped and didn’t make it past the Super Regional level, LTT! had a great time and learned a lot. “Honestly my favorite part of the competition was watching other people perform. It was a blend of experiencing really cool, innovative improv from around the country,” Isbill said. Tech’s group even picked up some tips and ideas from other college teams. With the new experiences and ideas, LTT! will continue to put out hilarious content for the Tech community to enjoy. They hit the stage after the Fridays of all DramaTech performances, and put on their own shows. On March 17, Neeta Thawani will direct “SuperHero Prov,” a show melding the DC and Marvel Comics universes. On April 7, “The Improvised Guide to the Galaxy” will use random characters take audience members on a journey through the galaxy under the direction of Thomas Bertron. Isbill encourages anyone interested in trying improv to visit one of their workshops, held on Mondays from 7 p.m. to 9 p.m. and on Saturdays from 10 a.m. to 1 p.m.